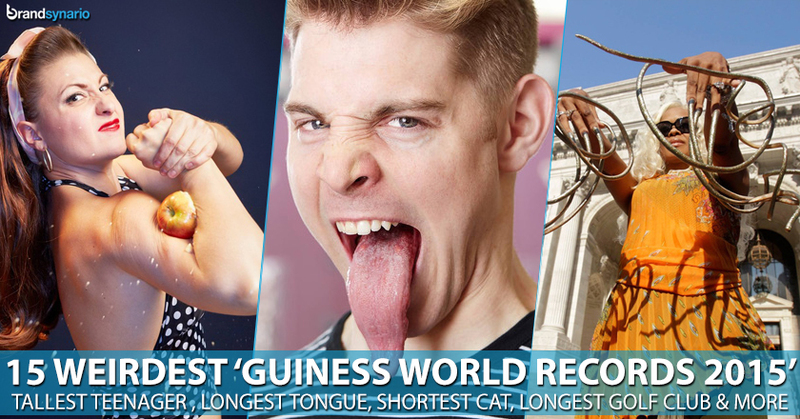 Finally the wait is over and the most awaited Guinness World Records 2015 edition is out now. The book was released on Wednesday, September 10th with a numerous amusingly strange and crazy world records. This edition is full of unique and hilarious records, ranging from the tallest teenager to the shortest cat – it covers everything even the largest Yo Yo and the longest golf club. The edition includes some fresh faces, whereas some veteran champions are also there. See them all in their quirky, world-dominating glory in the gallery below. This enormous disco ball measures 10.33 meters (about 33 feet) in diameter. Engineers dressed as space men pulled together to hang this giant twinkling sphere above the U.K. music festival. Usually an average human tongue measures about 4 inches, but Stoeberl’s tongue measures 3.97 inches from the tip to the middle of the closed lip. This artist and comedian is from California and is fittingly nicknamed “The Lick”. This Super cat is from Austin, Texas and can jump up to 6 feet high. The metal group has set a record in December 2013. They travelled to Carlini Station in Antarctica to entertain 120 scientists and competition winners. In their hour-long record breaking set, they performed 10 tracks. This gigantic toy measures 11 feet, 9 inches and weighs a whopping 4,620 pounds. Surprisingly, this giant construction took only a year and a half to build, and is fully functional. Lindberg a.k.a Mama Lou has made the most craziest world record and she can thank her mighty muscular arms for that. According to Guinness, she squashed eight apples in Los Angeles, California on June 26, 2013. This nine-year-old munchkin cat is the tiniest little creature. She measures only 5.25 inches from the floor to the shoulders. She’s owned by Christel Young and lives in Napa, California. A life-long collector, Bretell has managed to collect 94,268 comic books since he was 8 years old. His collection almost weighs up to 8.3 tons, which is as much as 118 adult men. The UK native brags a collection of 12,463 pieces of James Bond Memorabilia at last count. He keeps his collection in asecret place, away from the peeping eyes of friends. This Denmark native has created the world’s longest usable golf club, measuring 14 feet, 5 inches in length. According to Guinness, he’s uses his gigantic club to send a ball flying 542 feet, 10.62 inches. This thoughtfully named little caravan packs a full size bed, lighting, a TV, a sink and a kettle into a vehicle that measures only 7 feet, 10 inches in length, 5 feet, .24 inches in height and 2 feet, 7.9 inches in width. This huge instrument is playable. It measures 43 feet, 7.5 inches in height, 16 feet, 5.5 inches in width and weighs 2,000 pounds. Students from Conroe Independent School District Academy of Science and Technology in Texas sculpted the guitar after a 1967 Gibson Flying V. It cost only $3,000 to build. This little Pomeranian holds two records; fastest time to cover 10 meters on his hind legs and fastest time to cover five meters on his front legs. This Michigan high school student has a height of precise 7 feet, 1.5 inches. Though Brown is too big to play basketball, Nike has supplied him with size 24 athletic sneakers, which according to Guinness, is larger than those worn by Shaquille O’Neal. The Dutchess a.k.a. Christine Walton from Las Vegas, Nevada, has held the top spot since 2011. Last measured, her nails were 23 feet, 11 inches long. Next article6 Reasons Hum TV’s Drama Shanakht is a Must-Watch!